We are looking here at the ancient heresy of Marcion, who argued that the Old Testament must be repudiated by the church. Marcion, who lived about the years 85-160, taught that the Old Testament revealed a Creator deity who is not even the same God who sent Jesus. Unsurprisingly, he also held to a heretical Christology. Eventually, we learn to take an individual at his word. 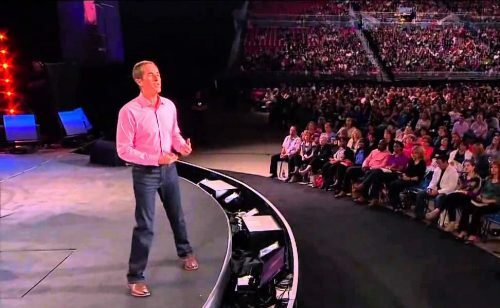 Andy Stanley is a master communicator, and he communicates very well and very often. His preaching and teaching often bring controversy, and he quite regularly makes arguments that subvert the authority of Scripture and cast doubt upon biblical Christianity. He returns regularly to certain themes and arguments — so regularly that we certainly get the point. He evidently wants us to understand that he means what he says. Again, controversy rightly erupted after those comments, spoken earlier this year. But in recent days Andy Stanley has returned to the same theme, this time in a conversation with Jonathan Merritt on his podcast, Seekers and Speakers. Well, wait just a minute. It is true that Jesus and the Apostles did not have the Old Testament and the New Testament bound together in a book (codex) form. It is, of course, also plainly true that the New Testament did not exist until it was given, book by book, by the Holy Spirit to the church in the first century. But it is not true that references to “the Scriptures” or “the Scripture” by Jesus and the Apostles are any mystery to us. They are plainly referring to what we know as the Old Testament. There are references to “Moses and the Prophets” (Luke 16:29) and to the “Law and the Prophets”(Luke 16:16), but faithful Jews in the first century would emphatically have known exactly what the Scriptures are. The fact that the Old Testament Scriptures were at the time in scroll form in synagogues rather than book form is plain, but the fact is that the Jewish authorities made their arguments on the basis of appeal to the Scriptures, and so did Jesus and the Apostles. Both Jesus and the Apostles did make their arguments “according to the Scriptures” (see, for example, Paul in 1 Corinthians 15:3-4).